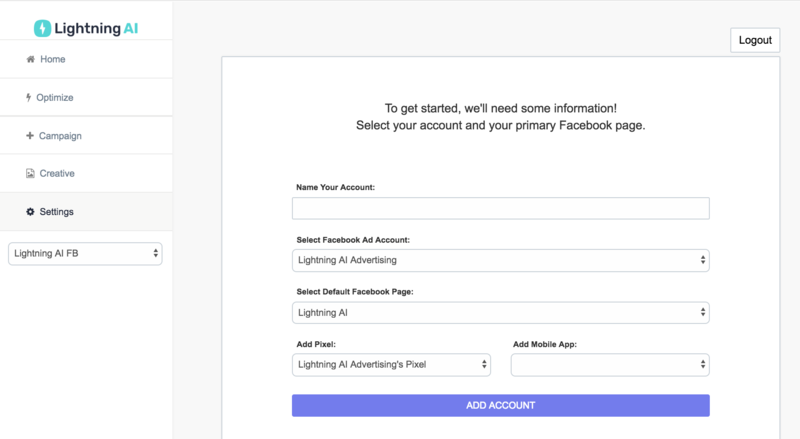 New startup, Lightning AI, bypassed the months of development and thousands of dollars of initial investment needed to create a client interface for their advertising optimisation system by choosing Anvil. Lightning AI created a user-interface with their existing machine-learning program, establishing product-market fit and allowing them to scale from a consultancy to an AI product-based business. Founded in San Francisco in 2016, Lightning AI set out to answer a question that plagues online marketers: “How do I continue to optimise my campaigns?” The hundreds of available targeting parameters for online advertising, yield quadrillions of possibilities, and the optimisation process is usually slow and labour-intensive. Lightning AI had developed a machine-learning system to automatically design, run and learn from A/B tests without human intervention. They had already started to prove this model as a consultancy, working with a small number of major advertisers. It was time to scale up. This meant creating a web control panel, to enable new and existing clients to design and manage their advertising campaigns. Lightning AI obtained quotes from development contractors, but they were facing a multi-month timeline and upfront costs of over $100,000 that would have made rapid iteration impossible. Lightning AI were looking for a low code or no code solution that would enable them, as data scientists, to build a full-scale web application with their existing Python skills, and easily link it to their existing machine-learning models. After examining the available tools, they chose Anvil. They built and iterated on the web front-end, which would allow clients to upload data files, ad copy and images, and successfully connected their machine-learning models to complete the system. They launched their first web platform within 3 weeks, bypassing thousands of dollars of initial investment and months of delay. By launching their web platform, Lightning AI scaled instantly from a consultancy to a product business, and reached profitability within 6 months. By retaining full control of the development cycle, they have been able to continually iterate their product offering, along with their data science toolkit, ensuring they stay at the forefront of the market. Lightning AI continues to iterate rapidly, and two years after launch has managed 50m of advertising spend for over 200 campaigns. They are approved marketing partners for Snapchat, Facebook and Google and were able to raise investment in Silicon Valley entirely because of the Anvil app integration. Their ever-more-powerful management system, built in Anvil, continues to serve at the core of their business. Anvil enabled Lightning AI to build and sell a powerful product without a large engineering team. This enabled them to raise money from a position of strength. Lightning AI provides a mix of AI-powered technology and managed services to track, measure and grow advertising campaigns. Find your ideal target audience on Facebook, Instagram, Google AdWords, and more. Find out more at lightningai.com. Anvil is a platform for building powerful applications quickly. Anvil’s design, development and hosting tools build on the industrial-strength Python language to deliver results 7 times faster than traditional web development. Find out more at anvil.works.